I propose to talk about the genesis of ideas, the process of originating ideas. Having ideas is a part of thinking. Some people have said that thinking is the process of solving problems. Professor John Cohen said some years ago in NATURE that thinking is much broader than this in scope: that in much of our thinking we are groping to find out what needs to be done rather than how it needs to be done. Some of the most significant new ideas in science involve the recognition of new problems. Many scientists have been interested in the question of the way in which scientific discoveries are made. A popular idea is that scientists apply their powerful intellects in the straightforward, logical induction of new general principles from known facts and the logical deduction of previously unrecognized conclusions from known principles. This method is, of course, sometimes used; but much advance in knowledge results from mental processes of another sort - in large part unconscious processes. Henry Poincare in his essay on mathematical creation said that knowledge of mathematics and of the rules of logic is not enough to make a man a creative mathematician; he must also be gifted with an intuition that permits him to select from among the infinite number of combinations of mathematical entities already known, most of them absolutely without interest, those combinations that will lead to useful and interesting results. In illustration, he described his investigations on the nature of the Fuchsian functions, which he had discovered while working at Caen. He left Caen on a geologic excursion, and for some tine, while traveling, made no conscious effort to attack the problem; then one day, as he put his foot on the step of an omnibus, the idea suddenly came to him that the transformations that he had used to define the Fuchsian functions are identical with those of non-Euclidian geometry. Several days later he verified this discovery by detailed analysis. From my own experience I have come to the conclusion that one way for me to have a new idea is to set my unconscious to work on a problem. This is probably what the Persian philosopher Avicenna, a thousand years ago, also did when he was unable to solve a problem. He would go to the mosque and pray for his understanding to be opened and his difficulties to be smoothed away; he probably had fixed the problem in his mind before going to the mosque, and his nature was such that his unconscious could then set to work on it. I doubt that the unconscious can be directed to work on a problem. But the problem can be suggested to it, and if it is interested in it something may result. C. G. Jung has said that art is a kind of innate drive that seizes a human being and makes him its instrument. A creative scientist is an artist - an artist whose ideas are in the field of science. W. W. Sawyer has described the behavior of school boys who are born mathematicians. They have mental venturesomeness: when one of them is told that no one has ever trisected an angle by means of ruler and compass alone, he attempts to carry out this operation; when he has been shown how to solve a quadratic equation by completing the square, he tries to solve a cubic equation by completing the cube; he has the desire to explore that marks the creative mathematician, and he may, throughout his life, have an unconscious that concerns itself, day after day (and also night after night) with the field of mathematics. Herbert Spencer has written that it was never his way to set himself a problem and puzzle out an answer; that instead the conclusions at which he had from time to time arrived had been arrived at unawares, each as the ultimate outcome of a body of thoughts that slowly grew from a germ. I once heard a commencement speaker say that there is no place in the world for the man who works just to satisfy his own curiosity, that instead everybody should work for the solution of problems that will benefit the world. He was an engineer, primarily interested in the application of knowledge to the solution of practical problems. But he had forgotten that the knowledge that he wishes to apply must first be obtained, and that to obtain it is not easy. The knowledge that we have about the world, and that is applied, for the benefit of mankind, to the problems of technology and medicine, has in the main been obtained by men who were satisfying their curiosity about the nature of the world; by pure scientists and mathematicians. The progress in the physical sciences and in technology that has taken place during recent decades has been based in large part on the developments in mathematics of the last two hundred years. Most of the mathematicians whose work has turned out to be fundamental to practical progress - did not make their mathematical discoveries for the use of the engineer, but rather to satisfy their own curiosity. Often a field of mathematics is not found to be valuable in technology for a long time - it is rarely that a mathematician sees his discoveries put to practical use during his lifetime. I could mention many examples of important discoveries in the field of physics and chemistry that have resulted from the effort of a scientist to satisfy his curiosity. It is, of course, possible to be curious about trivial matters - as Poincare said, a good mathematician has an intuition that leads him to select a significant field about which to be curious. During the years just before 1900 Max Planck became curious about the observed distribution of intensity with wavelength of the light given out by a heated body. His curiosity led him to discover the quantum of action, Planck's constant - one of the most important discoveries ever made. It is unlikely that Planck would have made this discovery if his interest in the radiation had been a practical one; he might well, instead of discovering the quantum theory, have developed an improved pyrometer, permitting high temperatures to be measured with greater accuracy than before, and the world would have suffered accordingly. Let us return to the question of the genesis of ideas. Albert Tyler has told me that Thomas Hunt Morgan once said to him that a little idea is enough to permit a scientist to get started. He told Tyler that even a simple experiment, when carried out, may suggest another one, and that another one, until, as the result of a succession of experiments and ideas, some significant discovery is made. As a geneticist, he might have said that ideas breed ideas. I was interested to learn, nearly twenty years ago, that there may be a great difference in the attitude toward the world of a biologist and a physicist. In the period between 1956 and 1939, when I had extended discussions with Dr. Karl Landsteiner about the problems of immunochemistry, I found that his attitude toward this subject was much different from mine - I think that his attitude was that of the experimental biologist, or at any rate of some experimental biologists, and my attitude was that of the theoretical physicist. He had the idea that nature must force us to accept ideas about the world. Often he would ask "What conclusions about the structure of antibodies and the nature of serological reactions are we forced to accept by these results of experiment and observation?" On the other hand, I would ask "What ideas about this question, as general and as esthetically satisfying as possible, can we have that are not eliminated by these results of experiment and observation?" Both of these attitudes toward the world are valuable; each of them provides a way of analyzing the situation, and each can lead to the suggestion of new experiments. I think that the great success that the theoretical physicists have had during the past sixty years in increasing our understanding of the world suggests that their method should be more generally applied also in other fields of science; perhaps also in the social sciences, to the extent that these fields of knowledge can be made sufficiently precise. The determination of the structure of crystals by the diffraction of x-rays provides interesting illustrations of the ways in which scientific progress is achieved. If the structure of a crystal is sufficiently simple, it can be determined from the observed x-ray diffraction pattern by straightforward, completely logical arguments. This method was largely used during the early years of x-ray diffraction, around 1920, and also during recent years. Another method, the stochastic method, was used with much success during the intermediate period. I applied the adjective stochastic to this method in 1933 at the suggestion of Karl K. Darrow, who referred me to the use of the word by the chemist Alexander Smith. In his "Inorganic Chemistry," 1909, page 142, he wrote "When Mitscherlich discovered that Glauber's salt gave a definite pressure of water vapor, he at once formed the hypothesis, that is, supposition, that other hydrates would be found to do likewise. Experiments showed this supposition to be correct. The hypothesis was at once displaced by the fact. This sort of hypothesis predicts the probable existence of certain facts or connections of facts, hence, reviving a disused word, we call it a stochastic hypothesis. (This derives from a Greek word meaning apt to divine the truth by conjecture.) It differs from the other kind in that it professes to be composed entirely of verifiable facts and is subjected to verification as quickly as possible." In the stochastic method of treating very complex crystals a plausible structure is guessed with the aid of hints provided by the observed size of unit and space-group symmetry, as well as knowledge of general principles of molecular structure, and the stochastic hypothesis that this is the actual structure of the crystal is thereupon either verified or disproved by the comparison of calculated and observed x-ray intensities. I may mention that mathematicians have recently used the word stochastic in a different sense. The stochastic methods of the mathematician involve the idea of randomness. Professor Nicholas D. Cheronis has pointed out to me that the use of the word stochastic by the Greeks did not contain the slightest suggestion of the random. Instead, Aristotle, Plato, Galon, and other classical authors used it in the sense of endeavoring to arrive at a conclusion or a solution of a problem at hand by thoughts from within, by reflective thinking, making a good guess. In order for the stochastic method to be significant the principles used in formulating a stochastic hypothesis must be restrictive enough to make the hypothesis itself essentially unique; that is, an investigator who makes use of this method should be allowed only one guess. If he were allowed many guesses he would sooner or later make one that was not in disagreement with the limited number of test points, but there would then be little justification for accepting that guess as correct. The problems that are now being attacked by science are so difficult that we cannot afford to overlook any possible aid to their solution. I think that the time has come to carry out a penetrating study of the principles of the stochastic method, in order to get a better understanding of it and to make it more powerful. We need to study the general problem of the genesis of ideas. I think that it is not unlikely that young men can be given some training in having ideas - would not instruction in the art of having ideas about good experiments be just as valuable to the young experimental scientist as Instruction in laboratory technique? I doubt, however, that we know enough at the present time about the genesis of ideas to plan a course of instruction. Twenty five years ago the Division of Chemistry and Chemical Engineering of the California Institute of Technology adopted the system, which has been used for many years in Holland, of requiring each candidate for a doctor's degree to submit a set of original propositions, about a dozen in number - that is, to formulate a dozen new ideas that he is prepared to defend at his doctor's examination. The young men who have been faced with this task have met the challenge with varying degrees of success. Probably all of them learned from the experience that original ideas are not easily got. Probably every one of them would have been grateful to have had at hand a book discussing the problem of how to have ideas. 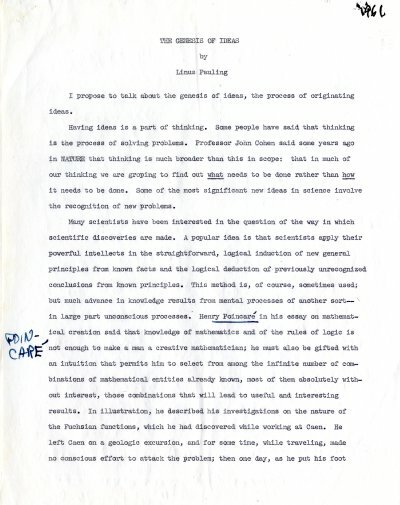 Some years ago E. Bright Wilson, Jr., of Harvard University, told me that he was planning to write a book on how to carry out scientific research, and intended to discuss the matter with a number of men who had carried out research successfully. I thought that the book would be on the problem of how to have ideas. His book was published nine years ago - "An Introduction to Scientific Research"; it is a fine book, but it is a book about how to work after you have had your ideas, and not how to have ideas. The statement in the book that comes closest to our problem is the following, from the first page: "Usually it is desirable to have new ideas of some sort before undertaking a problem..." I wish that this statement, instead of standing alone, had been followed by a hundred pages of discussion. My own experience, which I may illustrate in my talk by some examples, has suggested to me that it is possible to train the unconscious to help in the discovery of new ideas. I reached the conclusion some years ago that I had been making use of my unconscious in a well-defined way. I had developed the habit of thinking about certain scientific problems as I lay in bed, waiting to go to sleep. Sometimes I would think about the same problem for several nights in succession, while I was reading or making calculations about the problem during the day. Then I would stop working on the problem, and stop thinking about it in the period before going to sleep. Some weeks or months might go by, and then, suddenly, an idea that represented a solution to the problem or the germ of a solution to the problem would burst into my consciousness. I think that after this training the subconscious examined many ideas that entered my mind, and rejected those that had no interest in relation to the problem. Finally, after tens or hundreds of thousands of ideas had been examined in this way and rejected, another idea came along that was recognized by the unconscious as having some significant relation to the problem, and this idea and its relation to the problem were brought into the consciousness. As the world becomes more and more complex and the problems that remain to be solved become more and more difficult, it becomes necessary that we increase our efforts to solve them. A thorough study of the general problem of the genesis of ideas and the nature of creativity may well be of great value to the world.